A metal detectorist has tracked down a rare gold coin from Richard III’s reign near to the site of the Battle of Bosworth. The Half Angel is one of just a handful of such coins that have survived from the king’s two-year reign. It was discovered by Michelle Vall while she was taking part in a charity detecting rally in September at Monks Kirby, near the Bosworth Field. News of the discovery has just come to light. The coin will be auctioned international coins, medals and jewellery specialist Dix Noonan Webb in London on December 13. It is expected to fetch up to £15,000. Christopher Webb, head of the coins department at Dix Noonan Webb, said: “This is a very rare discovery that has miraculously survived in a field for more than five centuries. Michelle, a 51-year-old primary school teaching assistant, from Blackpool, said: “After detecting for two-and-a-half hours in a farmer’s field, I got a signal. “The coin was deep down, about 16 inches below the surface, and the soil there is thick clay so it took a bit of digging out. “I spotted this glint of gold in the hole, although I obviously did not know exactly what it was at first. I put it in the palm of my hand and then I went back to the organisers’ tent. Michelle has decided to sell the coin as, she said, it is “too valuable to keep”. She added: “I did not want to keep it in a locked cupboard. “I feel very privileged that I have found something so precious and historic. 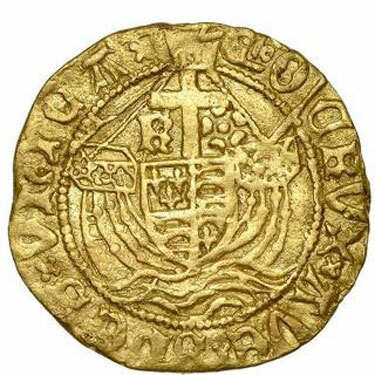 The Half Angel gold coin was first introduced in 1472 and was half the value of the Angel coin. Richard III issues of the coin are rare because his reign was so brief and there has always been a big interest in items from the controversial king’s rein particularly since his remains were discovered in Leicester in 2012. It is possible that the coin might have belonged to one of Richard’s soldiers fleeing from the battle that changed the course of English history. 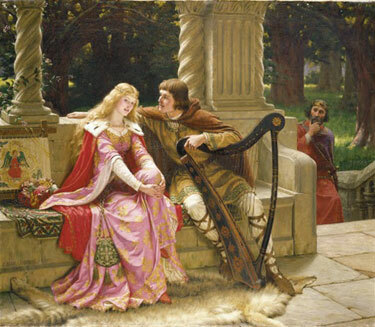 Edmund Blair Leighton, The End of the Song, 1802, private collection. 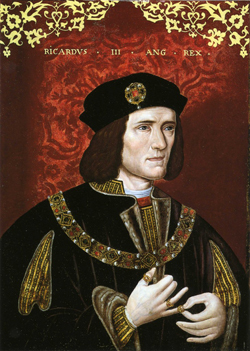 DNA testing of the bones of Richard III apparently demonstrates that what DNA testers refer to as a “non-paternal event” occurred at some crucial point in the blood-line of the British royal family. Although it is impossible to say when the affair happened, if it occurred around the time of Edward III (1312- 1377) it could call into question whether kings like Henry VI, Henry VII and Henry VIII had royal blood, and therefore the right to rule. Without his claim to royalty, Henry VII is unlikely to have been able to raise an army for the Battle of Bosworth Field, in which Richard III was killed, and the history of England could have been very different. And it has implications for our own Royal Family who also share a direct bloodline to the Tudors. 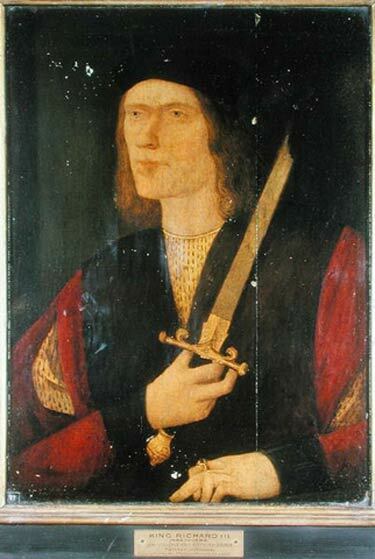 Unknown artist, King Richard III, late 16th century, National Portrait Gallery. 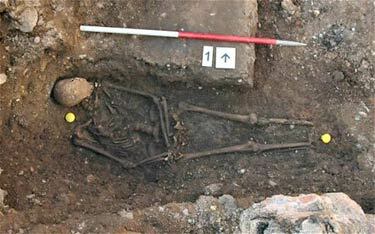 Chemical analysis of the bones and teeth of the skeleton found beneath the Leicester parking lot seems to confirm its identity as the remains of Richard III, the last Plantagenet king of England. The team analysed the isotopes found in three locations of King Richard III’s skeleton: his teeth, his femur, and his rib. Each showed elements related to geographical location, pollution, and diet: strontium, nitrogen, oxygen, carbon, and lead. As teeth and bones continue to change and develop throughout life, the team was able to map specific elements to locations and time frames. According to his femur — which shows an average of the last 15 years before death — Richard moved back to England’s east sometime in his adolescence or young adulthood, and his diet changed to match that of the high aristocracy. It is his rib that shows his later life. Typically, the ribs renew themselves quickly, so it only represents the last two to five years of life. It was in this period that Richard III’s diet changed the most — although the differences between femur and rib could indicate a relocation, Richard III did not move away from England’s east. The elements found in his rib suggests an increase in his diet of freshwater fish and birds — such as swan, crane, heron, and egret — which were popular choices for royal banquets. It also suggests that he was drinking more wine. Both these changes reinforce that food and drink — and, in particular, types of food and drink — were very important indicators of social status in England in the Middle Ages. him as he cam, but the king with great force drove him to the ground, making way with weapon on every syde. But yeat Henry abode the brunt longer than ever his owne soldiers wold have wenyd, who wer now almost owt of hope of victory, whan as loe William Stanley with thre thowsand men came to the reskew: than trewly in a very moment the resydew all fled, and king Richerd alone was killyd fyghting manfully in the thickkest presse of his enemyes. In the mean time also the erle of Oxfoord after a lyttle bickering put to flight them that fowght in the forward, wherof a great company wer killed in the chase. But many mo forbare to fyght, who came to the fielde with king Richerd for aw, and for no goodwill, and departyd withowt any daunger, as men who desyryd not the safety but destruction of that prince Noblemen whom they hatyd. Ther wer killyd about a M.  men, and emon est them of noblemen of warre John duke of Norfolk, Gwalter L. Ferryse, Robert Brakkenbury, Rycherd Ratclyff and many moe. Two days after at Leycester, William Catesby, lawyer, with a few that wer his felowys, were executyd. And of those that tooke them to ther fete Frauncis L. Loovell, Humfrey Staffoord, with Thomas his brother and muche more company, fled into the sayntuary of Saint John which is at Colchester, a toune by the sea syde in Essex. As for the number of captyves yt was very great; for whan king Richerd was killyd, all men furthwith threw away weapon, and frely submyttyd them selfes to Henryes obeyssance, wherof the most part wold have doone the same at the beginning, yf for king Rycherds scurryers, scowring to and fro, they myght so have doone. Emongest them the chiefe wer Henry erle of Northumberland, and Thomas erle of Surrey. This man was commyttyd to ward, wher he remaynyd long; he as frind in hart was receavyd into favor. Henry lost in that battayll scarce an hundreth soldiers, emongst whom there was one princypall man, William Brandon, who bare erle Henryes standerd. The feilde was fowghten the xj th. calends of September, in the yere of mans salvation M.cccc.lxxxvj, and the fight lasted more than two houres. The report is that king Richerd might have sowght to save himself by flight; for they who wer abowt him, seing the soldiers even from the first stroke to lyft up ther weapons febly and fayntlye, and soome of them to depart the feild pryvyly, suspectyd treason, and exhortyd him to flye, yea and whan the matter began manyfestly to qwaile, they browght him swyft horses; but he, who was not ignorant that the people hatyd him, owt of hope to have any better hap afterward, ys sayd to have awnsweryd, that that very day he wold make end ether of warre or lyfe, suche great fearcenesse and suche huge force of mynd he had: wherfor, knowinge certanely that that day wold ether yeald him a peaceable and quyet realme from thencefurth or els perpetually bereve him the same, he came to the fielde with the crowne uppon his head that therby he might ether make a beginning or ende of his raigne. And so the myserable man had suddaynly suche end as wont ys to happen to them that have right and law both of God and man in lyke estimation, as will, irnpyetie, and wickedries. Surely these are more vehement examples by muche than ys hable to be utteryd with toong to tereyfy those men which suffer no time to passe free from soome haynous offence, creweltie, or mischief. Henry, after the victory obtaynyd, gave furthwith thanks unto Almightie God for the same; than after, replenysshyd with joy incredible, he got himself unto the next hill, wher, after he had commendyd his solders, and commandyd to cure the woundyd, and to bury them that wer slane, he gave unto the nobylytie and gentlemen immortal thankes, promysing that he wold be myndfull of ther benyfyttes, all which meane whyle the soldiers cryed, God save king Henry, God save king Henry ! and with hart and hand utteryd all the shew of joy that might be ; which whan Thomas Stanley dyd see, he set anon king Richerds crowne, which was fownd among the spoyle in the feilde, uppon his head, as thoughe he had bene already by commandment of the people proclamyd kingafter the maner of his auncestors, and that was the first signe of prosperytie. After that, commanding to pak upp all bag and baggage, Henry with his victorious army procedyd in the evening to Leycester, wher, for refresshing of his soldiers from ther travaile and panes, and to prepare for going to London, he taryed two days. In the meane time the body of king Rycherd nakyd of all clothing, and layd uppon an horse bake with the armes and legges hanginge downe on both sydes, was browght to thabbay of monks Franciscanes at Leycester, a myserable spectacle in good sooth, but not unwoorthy for the mans lyfe, and ther was buryed two days after without any pompe or solemne funerall. He raigned two yeres and so many monethes, and one day over. He was lyttle of stature, deformyd of body, thone showlder being higher than thother, a short and sowre cowntenance, which semyd to savor of mischief, and utter evydently craft and deceyt. The whyle he was thinking of any matter, he dyd contynually byte his nether lyppe, as thowgh that crewell nature of his did so rage agaynst yt self in that lyttle carkase. Also he was woont to be ever with his right hand pulling out of the sheath to the myddest, and putting in agane, the dagger which he did alway were. Trewly he had a sharp witt, provydent and subtyle, apt both to counterfayt and dissemble; his corage also hault and fearce, which faylyd him not in the very death, which, whan his men forsooke him, he rather yealded to take with the swoord, than by fowle flyght to prolong his lyfe, uncertane what death perchance soon after by sicknes or other vyolence to suffer. On 22 August 1485, Richard met his rival Henry Tudor – the soon-to-be Henry VII – in fields near Market Bosworth in Leicestershire. Most sources agree Richard’s army was larger, but it failed to sweep his enemy from the field. Dr Steven Gunn, a fellow in modern history at Merton College, Oxford, said Tudor historian Polydore Vergil wrote a vivid account of Richard’s next, extraordinary, move. 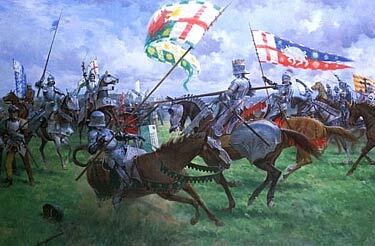 He explained: “He says spies told Richard that Henry was riding with a small number of men, so when he sees this, Richard leads a charge straight at him. “Richard is then surrounded by enemy troops but Vergil only says he was killed ‘fighting in the thickest of the press’. Results of mtDNA analysis: positive. 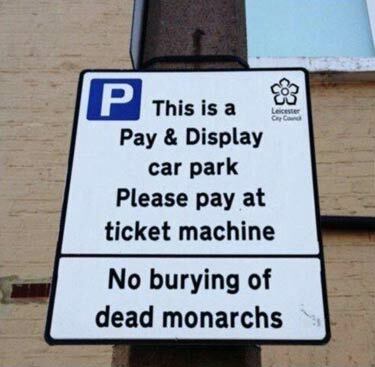 The search in Leicester for the remains of Richard III, the last Plantagenet monarch of England slain August 22, 1485 at Bosworth Field, may have achieved success. The Telegraph reports the finding of remains that may very possibly be those of Richard. To their astonishment, an excavation unearthed a result which experts said were “beyond out wildest dreams”. Richard’s two year reign was the subject of one of William Shakespeare’s most famous plays, which portrayed him as an evil, ugly hunchback, and which helped cement the public perception of him. A new book by David Baldwin, a lecturer at the University of Leicester advances the rather tenuous theory that Richard, Duke of York (b. 1473 – believed murdered 1483), the younger of the two sons of Edward IV imprisoned in the Tower was not murdered by his uncle Richard III, and was the bricklayer resident at St. John’s Abbey in Colchester known as Richard Plantagenet, who claimed to be an illegitimate child of Richard III, and who died after the dissolution of the monasteries at Eastwell in Kent in 1550. Of course, the skeletons of two children were discovered in the tower in 1674. They were believed to be the remains of the lost princes, and were reburied in Westminster Abbey. 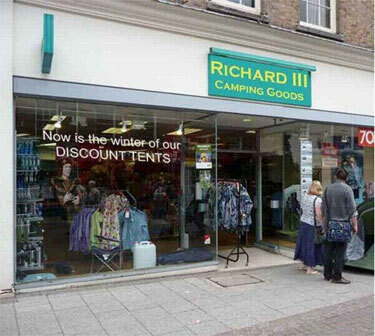 the Archives of Never Yet Melted in the 'Richard III' Category.